19 – the number of icebergs that third class survivor Charles Dahl later claimed he had seen from lifeboat number 15, during the hours following the sinking. In an interview with the Chicago American newspaper Dahl criticized the speed at which Titanic had been traveling through the ice field, describing how Carpathia had needed to zigzag through bergs whilst collecting survivors. 11:39 pm – the time at which the iceberg Titanic struck was first spotted, too late to avoid a collision. 30 seconds – the amount of time from the first sighting of the iceberg to the impact. 50 – 100 feet – the estimated height of the iceberg above water, as recounted by Titanic survivors. 200 – 400 feet – the estimated length of the iceberg. 5 – the number of days after the sinking when Rehorek took his photograph of the iceberg. 85% – the amount of all icebergs in the North Atlantic that originate from the west coast of Greenland. 1909 – the year in which the Titanic iceberg is believed to have been ‘born’. 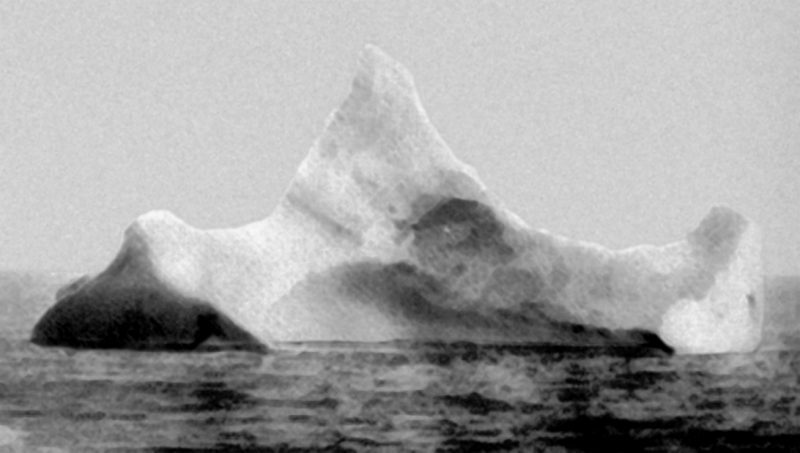 1 – 2 – the likely number of icebergs that the Ilulissat ice-shelf would have produced in 1909. 1 – 4% – the proportion of those icebergs that survive to reach shipping waters. They initially float north along Greenland’s west coast before beginning their southward journey past the coastlines of Baffin Island, Labrador and Newfoundland, before passing through the gulf stream into the Atlantic past. Most do not make it this far, either getting caught en route or finally melting in the warm waters of the gulf stream.